Arduino Day is a worldwide birthday celebration of Arduino. 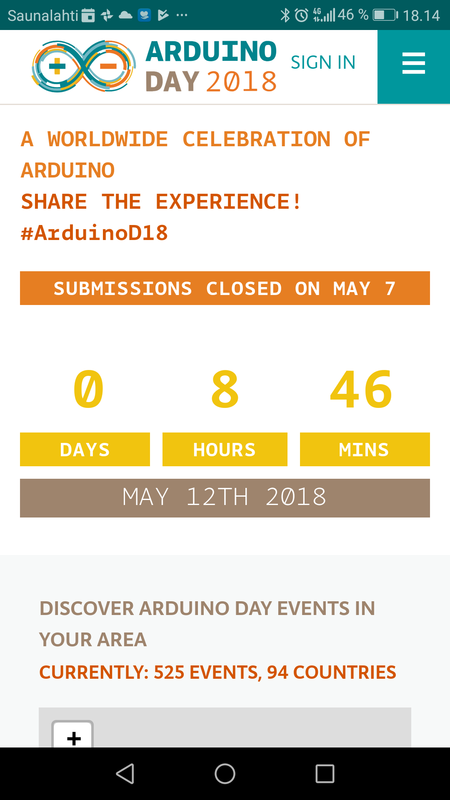 It’s a 24-hour-long event organized by the community and Arduino’s founders, where people interested in Arduino come together. The MKR family gets bigger with two new IoT boards! We’re excited to announce two new wireless connectivity boards to help streamline Internet of Things development, the MKR WiFi 1010 and MKR NB 1500. The first of the boards is the MKR WiFi 1010, which offers low power consumption and has been designed not only to speed up and simplify the prototyping of WiFi-based IoT applications, but also to be embedded in production IoT applications that require WiFi connectivity. comes equipped with an ESP32-based module manufactured by U-blox. 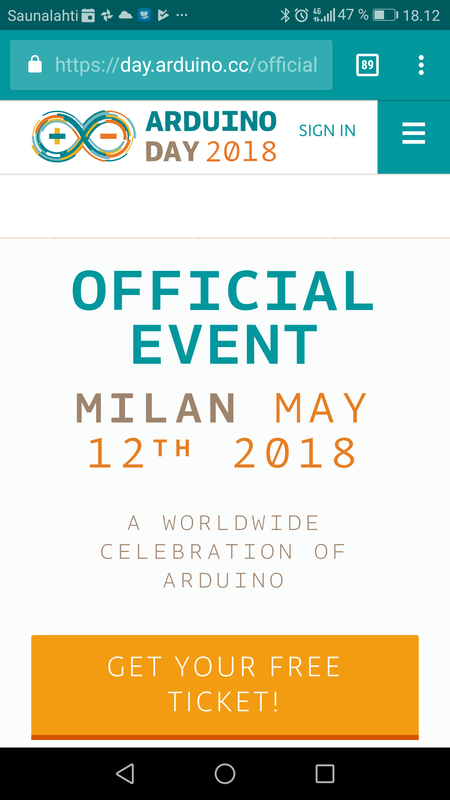 Not in Milan for Arduino Day? Not a problem! Here’s your chance to share your Arduino-based creations with the rest of the Arduino-speaking world. Following its introduction circa 2003 to 2005, the Arduino has had a tremendous influence on young people, students, and makers of all ages. In celebration of the Arduino and its impact on the world, I’d like to invite you to share your Arduino-based projects with me. processors on-board. The main Microchip SAM D21 is accompanied by an Intel Cyclone 10 FPGA, alongside a u-blox NINA-W102— an ESP32-based wireless module—to provide both WiFi and BLE connectivity. The MKR Vidor 4000 also has a Microchip ATECC508A cryptographic co-processer providing hardware-based security, and hardware-based key storage, for connecting your projects to the cloud. Joining the recently announced MKR WiFi 1010 and MKR NB 1500 and extending the boards with the new ‘standard’ Arduino form factor, the MKR Vidor 4000 is the first board from Arduino to have an FPGA on-board. the new Arduino Uno WiFi isn’t just a straight up replacement for the now venerable Arduino Uno. The current Uno is built around an 8-bit Microchip ATmega328P, while the latest is powered by an ATmega4809. The ATmega4809 is the first AVR device to feature Microchip’s Core Independent Peripherals (CIP), and having this on the Arduino is a perhaps a bigger deal than it appears on the surface. Yet while CIP support for the new board will no doubt be available in Microchip’s Atmel Studio, or MPLAB X, development environments it’s not yet clear how support will be exposed in Arduino’s own native development environment. Native Arduino library support will no doubt define how much adoption this new feature gets from the community. A note of appreciation to mark the crystal anniversary of the little open-source device that spawned a movement. The heart and soul of technology is engineering development. Regardless of the advance, no matter the science, nothing matters until it is manifested in a solution that is useful to people. I am fond of using the “tree falls” line in that context, in that the tree could fall and deafen every animal in the forest, but if a person didn’t hear it, it didn’t make a noise. If a technology cannot create a solution, it cannot be called engineering. That’s why it is so important to laud the Arduino and all it represents. This little open-source device created a new market segment while empowering several other existing and emerging ones. Named after a bar in Ivrea, Italy (drinking and development often go hand in hand — where else to get napkins? ), the Arduino Project was started there by a group of students at the Interaction Design Institute Ivrea. Their goal was to create a simple computer to automate projects for people involved in product design both in and out of the engineering community. It was that “in-and-out” aspect that revolutionized the industry. Prior to the Arduino, there was no low-cost, relatively simple way to embed electronics in anything. If you needed a sensor monitor, you had to build one from scratch. Hobbyists could buy finished subsystems in some populist hobby areas, but if you treaded a centimeter off the beaten path, you were immediately without any general solutions.